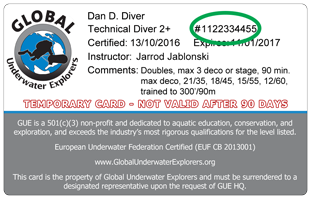 To verify a diver’s Certification from Global Underwater Explorers (GUE), visit this page. All that is needed is the certification number on the card. 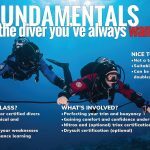 Global Underwater Explorers (GUE) is a comparatively-small but global and internationally recognized organization providing all levels of SCUBA diving training, from learn-to-dive to cave and technical training. GUE’s headquarters are located in High Springs, Florida, USA. GUE is a 501(c)3 non-profit and dedicated to aquatic education, conservation, and exploration. GUE certifications exceed the industry’s most rigorous qualifications for the level listed. Some GUE courses are also EN 14153-2, ISO 24801-2, & ISO 11107 certified.